Huang Yong Ping’s spectacular Ressort 2012 is part of a series of large-scale sculptures that depict a snake or dragon, a central symbol in Chinese culture, as well as in many other countries around the world. The work plays on different interpretations of the snake, from creation and temptation to wisdom and deception. Symbolically linking sky and water, Ressort (a French word meaning ‘spring’, but also ‘resilience’ and ‘energy’) epitomises Huang Yong Ping’s ability to offer an open interpretation while making deep connections to human experience and belief. 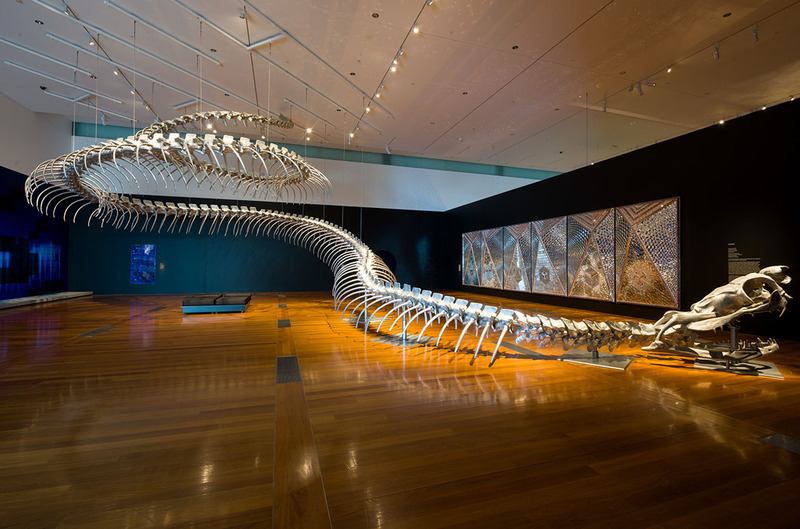 View our time lapse to watch the installation of this massive snake skeleton sculpture during ‘Sugar Spin: you, me, art and everything’. Huang Yong Ping emerged as a key figure in the Chinese avant-garde of the 1980s and has been based in Paris since 1989. He is internationally recognised for his allegorical works, which draw on the artistic and philosophical traditions of China and Europe to reflect on new global realities. Chance and fate, conflict and humour inflect his vision of how different societies operate and interact with each other. He reworks architectural and animal forms to create massive sculptures and installations that often reference the history, culture and landscape of the site in which the works are shown. 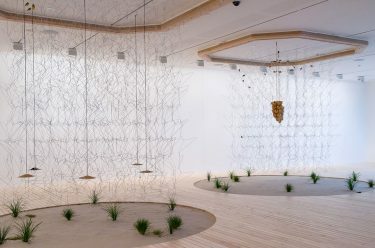 Huang Yong Ping visited the Gallery in 2012 to discuss Ressort when the artwork was first exhibited during ‘The Seventh Asia Pacific Triennial of Contemporary Art’ (APT7). 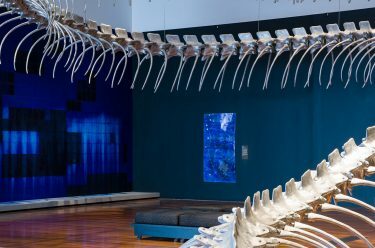 Ressort dominated the Queensland Art Gallery’s Water Mall as it spiraled from the ceiling to the floor, metaphorically linking sky and water.